At the beginning we would like to show off our Model of the year prize we won on SPIELWARENHESSE 2016 in Nuremberg with our Schulgleiter SG 38 in 1/48 scale. After all of those demanding business meetings we can finally say, that our participation on SPIELWARENHESSE 2016 was really a successful one. It was nice to meet our business partners. 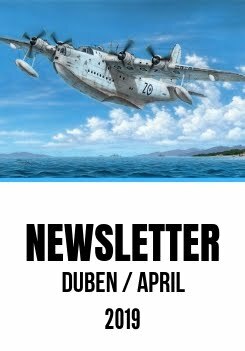 We also announced new models, the whole list of models we are preparing for the second half of this year is attached to this newsletter. The Skoda Works in Pilsen had been a traditional gun manufacturer and supplier already since the times of the Austro-Hungarian Empire, and after the independent Czechoslovak Republic was established in 1918, the company continued in this tradition and became one of the major armament suppliers for the new Czechoslovak Army and also exported large numbers of weapons world wide. In the 1930s, the Skoda development department came up with a design for a modern 37mm A3 anti-tank gun, which was later accepted by the Army and used under designation 3,7cm KPUV vz.34, (KPUV standing for Kanon Proti Utocne Vozbe, or Anti-Tank Gun). The Skoda design team did not lie back on their laurels and developed a modernised type known as the A4 which gained excellent results while it was being tested and surpassed considerably the original 3,7cm KPUV gun. However, the new type used a different type of ammunition and therefore its breech had to be redesigned to be capable of using the earlier ammo as well. After that, nothing stood against the A4 gun being accepted by the Czechoslovak Army, which used it under 3,7cm KPUV vz.37 designation. At that time, this weapon was the world´s best in its category. The production guns were supplied in several varieties, as Type P for infantry units (P=pěchota, or Infantry) with spoked wheels, for cavalry units as Type J (J for jezdectvo, Cavalry) with pneumatic wheels with standard discs and as Type M which could have been transported behind a motorised vehicles. The A4 guns were also exported to Yugoslavia, Bulgaria and Hungary, besides others. In 1938, nearly one thousand KPUV guns of both types were ready to defend Czechoslovakia, 390 of them were of vz.37 Type P and 300 of vz.37 Type M. The 3,7cm KPUV Gun vz.37 was capable to shoot through the armour of all Wehrmacht´s tanks. However, in the end, these guns were first used in combat by the German Wehrmacht, which, having realised the Czechoslovak guns were superior to German ones, put them into service under 3,7cm PAK 37(t) designation. And, how effective these guns were, soldiers of Poland, France, Belgium, Luxembourg and the Netherlands found out to their detriment. In the end, only the attack against the Soviet Union made the 37mm guns obsolete as they were no longer effective against the new Soviet mid and heavy tank armours. Nevertheless, the guns remained on strenght almost until the end of the war. Amongst their users were also the army of the Slovak State, which had been built on the ruins of former Czechoslovakia, the Slovak Army deployed the 3,7cm guns also against the USSR, but with similar trouble as the Wehrmacht. Parts of the model were designed in 3D and they‘re pressed in a steel mold. They are distributed into two frames made of grey plastic. Full colour manual offers three different kinds of cannons – one in tricolor camouflage of the Czechoslovak army and two cannons used by Wehrmacht. One of the captured cannons is in the original Czechoslovak army colouring, the second one – called Bertha – is in german panzer grau colouring. It was a long time tradition for the army of the Austro-Hungarian Empire to use mountain guns, and in the beginning of the 20th century, mountain guns Mark 75 and Mark 99 were widely used. These types, however, were becoming outdated quite quickly becauseof rapid development of artillery techology of those times. The Skoda Works in Pilsen, a traditional supplier of artillery armament, had since the beginning of the century been developing several projects of mountain guns with various calibers. When a 7cm Gebirgskanone M.9 had been built in small production run, a new and heavier caliber (7.5cm) gun was developed, which eventualy became to be produced in 1912, mainly on basis of an interest from foreign customers. The last production batch of this gun, that had been intended for Chinese government, was taken over by the Austro-Hungarian Army and put into service as a 7.5cm Gebirgskanone M.14. But, already a year ago those guns had been tested by the military and requirements for a new model of a mountain gun had been defined. As the First World War broke out, it accelerated everything. Prototype guns with some improvements made on basis of requirements from the military were tested during 1914 and production of the new model followed shortly. The new gun was put into the service with the Austro Hungarian army as a 7.5cm Gebirgskanone M.15. It was possible to dismantle the weapon to six main components that were to be carried by draught animals. Another three horses or mules carried the ammunition shield, the sights and standby supply of ammunition. These new guns were used for the very first time at the Italian front in the early stages of 1916. They proved to be much better and more reliable then their Italian counterparts. Over 2000 of these guns were produced during WW1, not only by the original manufacturer, but also by Hungarian arsenal works in Győr, under a license there. The guns were also used by allies of the Austro-Hungarian Empire, Bulgaria, Turkey and Germany. There were only a very few cases just like this one that Germany took over armament designed and produced abroad and it seems to have shown the qualities of this particular weapon. When WW1 ended, the 7.5cm Gebirgskanone M.15 got into service with Italy and with armies of the majority of countries in Middle Europe and the Balkans. Both the Skoda Works and the Győr factory kept on producing the gun also after the war. They were used by the army of the Czechoslovak Republic under the designation Horsky kanon vz.15 (or literally Mountain Gun mark 15), in fact they remained in service since the early days of independent Czechoslovakia right up to its occupation by Nazi Germany. The guns were deployed to artillery regiments as well as to mountain artillery units that were part of so called field artillery brigades. They were used also in armoured trains and Danube fleet boats and in 1938, also as a kind of emergency armament of the border strongholds. As the Czechoslovak Republic became occupied, the majority of the guns were handed over to the Wehrmacht and the rest went to the independent Slovak State. In German service, these guns were known as the GebK 15(t) and they were used along ex-Bundesheer weapons of the same type that had been acquired in 1938 following the Annexation of Austria and consequently designated as the GebK 15(ö). In the course of WW2, the same weapons fell into the German hands also from Yugoslavia (these were GebK 259(j)), Italy (GebK 259(i)) and Slovakia and were used at the Eastern Front, in the Balkans and in Italy. The Slovaks operated these guns at the Eastern Front by the side of their German ally and also during the Slovak National Uprising in 1944, but this time against the Germans. Eventually, as the Uprising was defeated, the guns were captured by the Wehrmacht and put into the service. In Italian army, captured 7.5 Gebirgskanone M.15 were used at first, with designation Obice da 75/13, later the Italians decided to buy more of them directly from the Hungarian manufacturer in Györ. These were used during the Ethiopian campaign and also in the Balkans and Africa during WW2. In 1944, some of them were also used against the Germans in Italy. The end of the war did not bring an end of the service for these reliable weapons as they remained with Italian army well up to the fifties and for equally long period of time they were used also by Turkey. Among others, the Gebirgskanone M.15 were used also in Albania, Bulgaria, Yugoslavia, Colombia, Poland, Romania, Greece and Spain. Parts of the model were designed in 3D and they‘re pressed in a steel mold. They are distributed into two frames made of grey plastic. Full colour manual offers a cannon in colouring of the Czechoslovak army, Italy, Austro-Hungary and Wehrmacht. In April 1934 Air Ministry issued specifications for new coastal anti-submarine patrol aircraft. It was addressed to several companies but also to Avro. The chosen designs were De Havilland DH-89M and Avro 652A. Both aircraft were derived from civilian version. Avro 652A was designed for crew of three with one fixed machine gun in nose and one flexible in dorsal turret. The bomb bay designed to carry anti-submarine bombs was located in center wing section. The first prototype of the military version took off on March 24, 1934. It showed excellent range, endurance and generally higher performances than DH-89M. Avro won the competition. The production machines were designated Anson Mk.I and were delivered to RAF from the beginning of 1935. Ansons were also exported to Australia, Finland, Ireland, Egypt and others. They were used by RAF for anti-submarine patrols. Since 1939-40 they were started to be replaced by Hudsons. During the war the main Ansons’ main role was crew training. Considering Commonwealth the Ansons were standard aircraft for aerial training. Ansons were in dismounted state also delivered to Canada where it got several types of engines. According to the used engines the aircraft were designated Anson Mk.II and III. Some aircraft were also taken over by USAAF and designated them as AT-20. Later on a license production was started in Canada and further development. Newer Canadian versions got different fuselage with plywood skinning. The reissue of this successful model offers (besides of a new box) original sprues, two frames of parts made of grey plastic, one frame of clear parts, resin parts and etchings. The decals offer three Ansons in RAF camouflage. This control surfaces set offers separate ailerons, elevators (the tailplane is to be used from the kit) and a rudder. The cast parts feature very fine inspection panels and engraved lines. The Mk.82 AIR is one of the improved versions of the standard Mk.82 type. It is equipped with a BSU-49/B tail section, or so-called Air Inflatable Retarder, kind of merge of a chute and a baloon. After the bomb is dropped, the nylon-made retarder gets inflated behind the body of the bomb using the aerodynamical forces. This set contains two bombs, each of them consists of several resin parts. Accompanying decal sheet offers a set of useful stencilling. The Mk.82 AIR is one of the improved versions of the standard Mk.82 type. It is equipped with a BSU-49/B tail section, or so-called Air Inflatable Retarder, kind of merge of a chute and a baloon. As the bomb is dropped, the nylon-made retarder gets inflated behind the body of the bomb using the aerodynamical forces. The iconic Spitfire Mk.I was armed with eight Browning .303 machine guns. This highly detailed set offers the modeller to portray his Spitfire model with all armament compartments open and the detailed MGs well visible. One of the most commonly used type of modern American bombs, the 500lb Mk.82, saw the service for the very first time during the war in Vietnam. It is of LDGP – Low Drag, General Purpose type. The Mk.82 bomb is still used today and also serves as a basis for many modernised guided-bomb types. By assembling the parts of our set, the modeller gets two bomb units and after painting, the included decal sheet with stencils may also come handy. This set brings the modeller separate ailerons, wing flaps, elevators (the tailplane is to be taken from the model) and a separate rudder. The new parts come with nicely portrayed engraving of panel lines and inspection hatches. One of the most commonly used type of modern American bombs, the 500lb Mk.82, saw the service for the very first time during the war in Vietnam. It is of LDGP – Low Drag, General Purpose type. The Mk.82 bomb is still used tody and also serves as a basis for many modernised guided-bomb types.